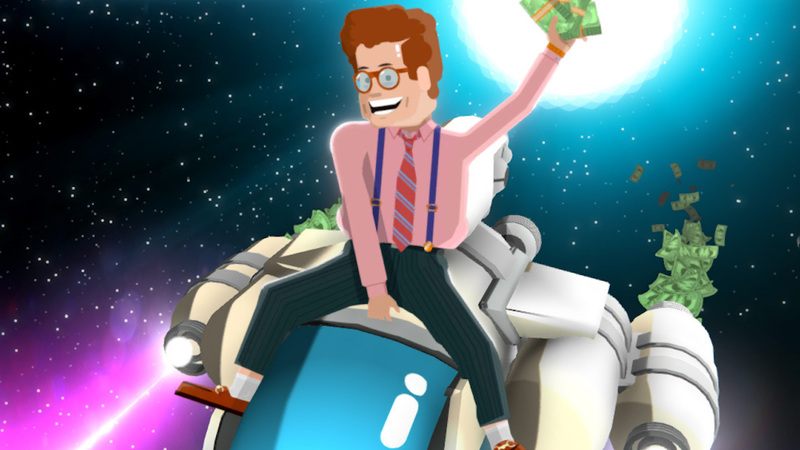 After immediately seeing Jimmy Goldman straddling your spaceship and waving cash around, it’s clear that Vostok Inc. is a game that is never in any danger of taking itself too seriously. Your entrepreneurial spirit guide is an enthusiastic one and is only too happy to help you build the richest and most awesome company in the galaxy. That can only be a good thing seeing as you are the newly appointed CEO at Vostok Inc., and, as a greedy space-capitalist, it will come as no surprise that your ultimate goal in this part twin-stick shooter, part planetary resource management is to make as much Moolah – which is the universal currency – as you possibly can. It will require some patience to amass your fortune, though. Early on it will be slow progress as, much to their anger, you obliterate United Federation of Sol ships and asteroids for whatever small change is left behind in their debris. But, as Jimmy Goldman soon explains, it is exploiting the planets in the six solar systems that become the key to earning Mega-Moolah. That’s because each planet is rich in resources that are buried deep underground, and, as your Moolah balance continues to bulge, you can choose to spend it on constructing buildings and facilities. The clear benefit to this is that planets that you build on will then provide a steady source of income, even when you’re flying around the galaxy gunning down enemy ships. There are different buildings to consider too, starting with the basic mines that extract resources from deep underground, the Fast Agricultural Resource Manufactory (F.A.R.M) plants that turn organic materials into chemical energy, power stations that produce electricity, real estate to house your employees (and to let you claw back their wages), liquid processors, pharma labs, casinos, and more. It won’t come as a surprise that the more you build on each planet the more Moolah you earn per second, with cost-cutting building upgrades continuing to drive your income ever upwards to see Vostok Inc. soon ensnare you in its neverending gameplay loop that is heartily fuelled by corporate greed. which has seen developer Nosebleed Interactive nail down an entertaining concept but made a misstep in choosing to draw out the experience for too long. You can choose to idly orbit a planet in the background while your Moolah trickles in, but seeing as you must travel between them to collect your earnings early on in your newfound career, this isn’t the most productive way to spend your first few hours. Purchasing the Auto Transfer Moolah Collector on each planet should be your priority then, to deposit any generated Moolah directly into your wallet to remove the need to boost back and forth across each solar system. When you aren’t obsessing over how best to reinvest your accumulated Moolah, you can spend your time defending yourself against other ships. These are usually random encounters, but troublesome Scouts can call summon enemy ships to your location to start a Screen-Locked Battle. These, as the name suggests, lock the screen and see you faced with waves of enemy ships to blast to smithereens, with Moolah awaiting as your reward if you succeed. It’s important that you keep an eye on your health and energy, as while your energy (which powers your shield and boost) will recover over time your health won’t. In order to restore your health, you will need to return to Mother Base, as if you let it deplete entirely you will eject into your rather fragile Executive Escape Pod and have to make it back there without it blowing up. There’s no need to really fear death though, thanks to the Really Expensive Self Preservation for Abundantly Wealthy Narcissists (R.E.S.P.A.W.N.) system. Mother Base is also the place where you can peruse ship upgrades. Whether these be for your ship’s weapons, durability, or radar, these quickly become expensive to the point where that your enthusiasm for the constant grind once again starts to waver. Consultants, managers, and other executives left drifting in space that you can rescue are one idea to alleviate this, seeing as they can lend you a temporary multiplier to your income generation, but it’s hard not to shake the impression that the game is more of a time sink than it needs to be. Your quest to become the filthy, stinking rich CEO of Vostok Inc. is an entertaining ride that’s never short on humour-laden dialogue. Using wormholes to warp to other solar systems lends constant surprise in the species that you encounter who will oppose your financial pursuits. It is the relentless grind that is ultimately the weak point, letting down the successes that the game scores in other areas.